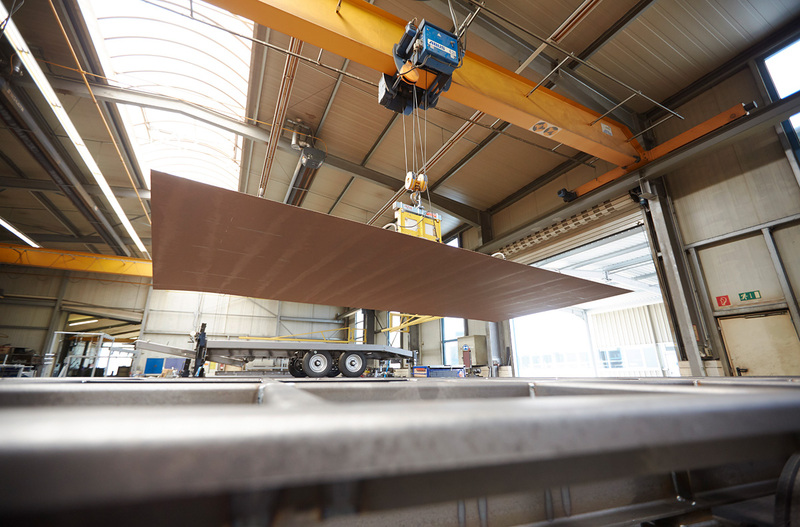 Custom made trailer solutions need to a high degree a flexibility in the production line, a big pool of experience as well as own construction performance. We fulfill all three requirements: we manufacture most of our trailer order based to the customer’s order. Within more than 50 years we have developped a lot of transport solutions together with our customers – the design and construction proposals come from our own construction department. The pool of experience we use is also found in our employees. A lot of them work more than 25 years in our company and a lot of details are not only filed in documents but also in the heads of our staff. We train our skilled workers ourselves – a lot of trainees stay in our company after their completion of training or go to the master- or technician school and then come back again. Eventually we make the drawing of the construction designs and calculation in a 3D CAD system. After the production planning all steel parts are being cleaned of rust and dirt in our steel blasting facility. This cares for a better varnishing quality and longer lifetime. We know, that welded joints are much more robust than riveted or screwed joints. Therefore all steel elements are welded and not screwed. Also galvanized chassis are first completely manufactured and welded and afterwards they are brought to the hot galvanizing line. After being completed with all detailed solutions the vehicles are being washed and cleaned off the welding fat. Simultaneously we apply a zinc-holding iron phosphate which procures a better rust shield. After the priming follows the electrostatic varnishing with Acryl-coating in two layers. 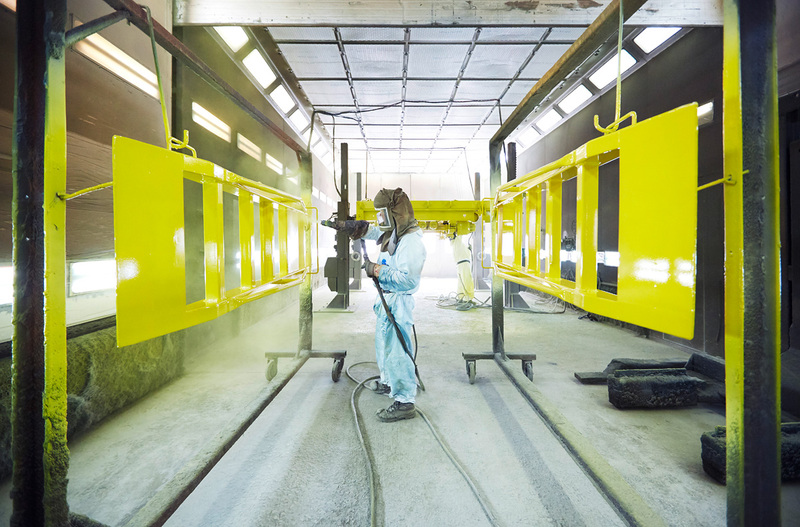 We rely and trust in the truck coatings of Glasurti/BASF since years. The result is with all colours the optimum and long-lasting. Eventually the customer can choose his RAL-colour! Afterwards the cavities are being filled with conserving wax. the wooden floor made of spruce wood is being planed and provided with tongue and groove and cut to measure. The spruce wood floor is being impregnated in an immersion bath. With all trailers above 10 t total weight we mount an upper floor made of high-quality spruce wood on top. Thus a change of the upper floor is easy and inexpensive.